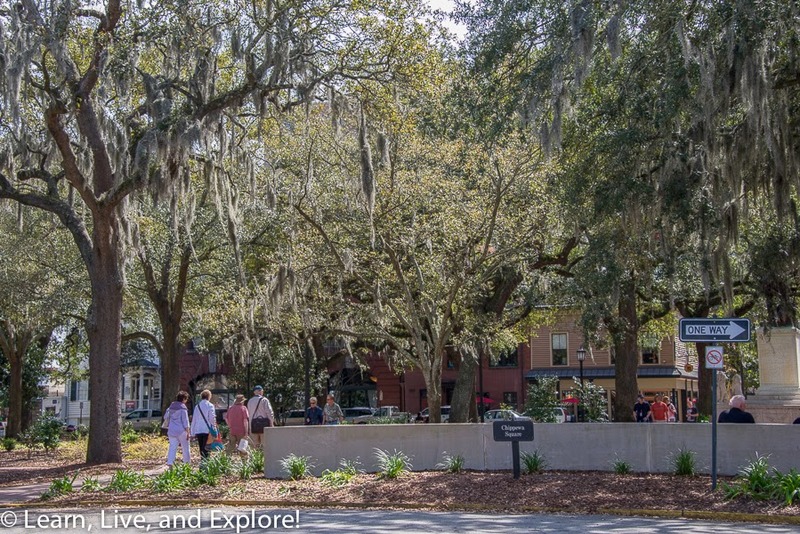 24 Hours in Savannah, Georgia ~ Learn, Live, and Explore! 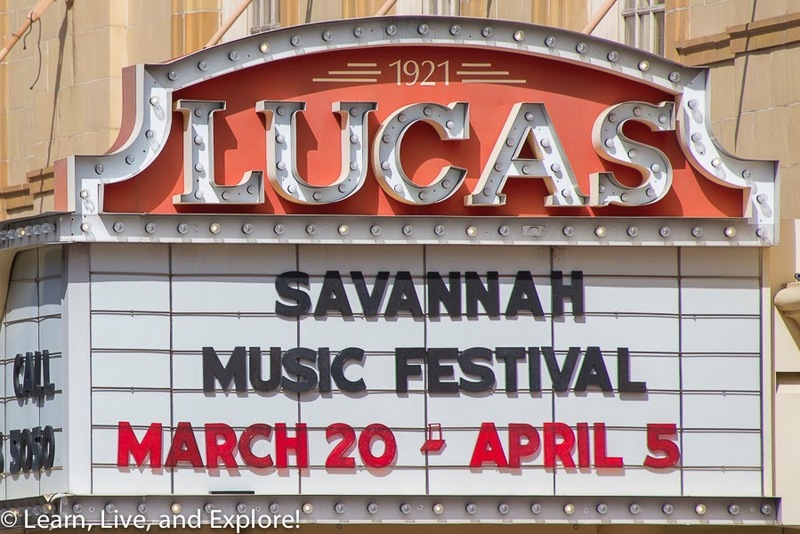 As I mentioned in my previous post about Charleston, the inspiration for this mini-break location was the Savannah Music Festival because the schedule included a performance from a progressive bluegrass band I am really liking right now: the Punch Brothers. Here's a little snippit from their concert, with a separate post to follow tomorrow. 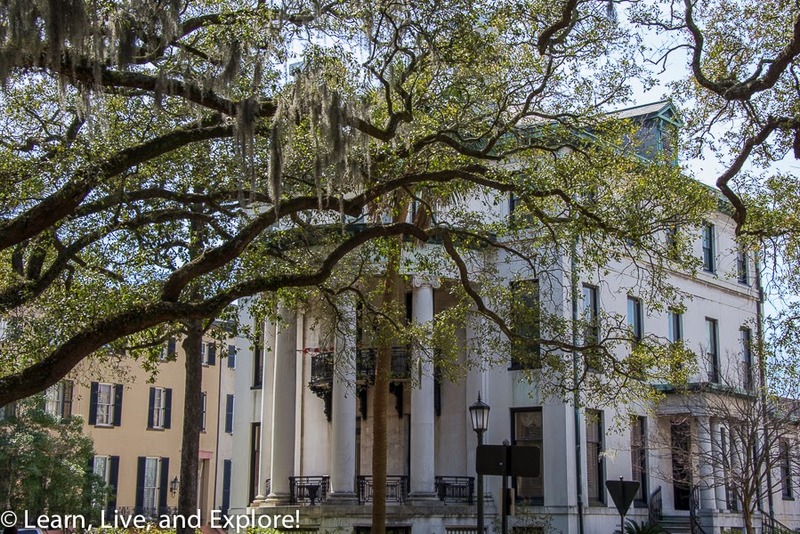 I also said previously that Charleston and Savannah have been on my travel short-list for a while, so it was about time that I finally found a reason to head south! 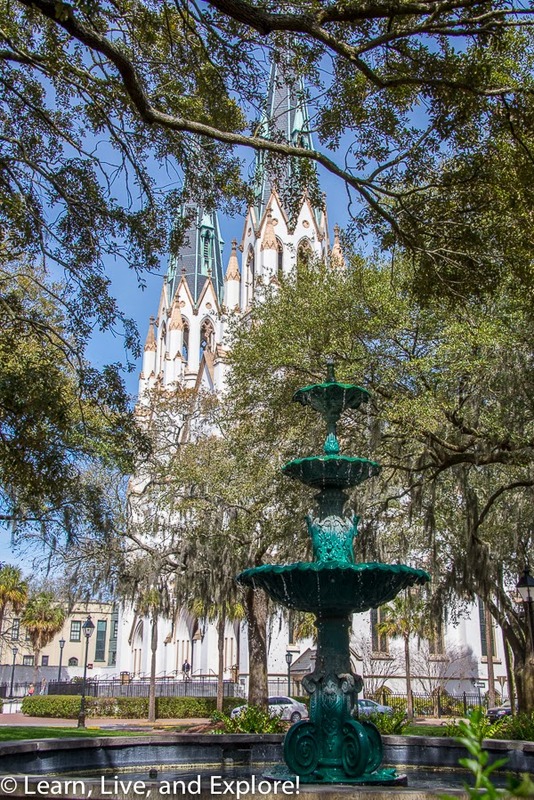 Of course, similar to Charleston, I had very limited time to spend in Savannah and had to make the most of every minute. In the end, I definitely thought I saw enough to know that I need to make another trip to the area now that I'm familiar with the beauty, the food, and the shopping. Once again, I had to decide my mode of transportation for touring the city. And, once again, I settled on a walking tour. Though the pedicab "Trips for Tips" option was a close second. 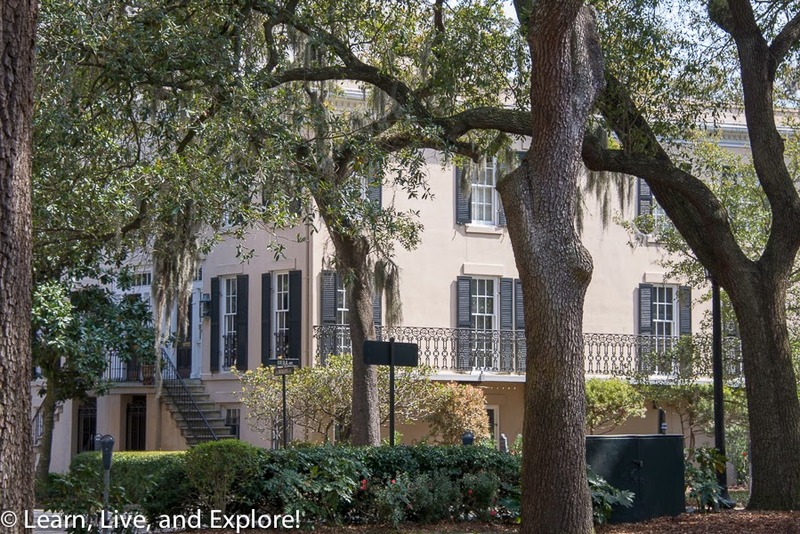 Savannah Dan's tour was ranked very high for tours on Trip Advisor, so the choice was simple. 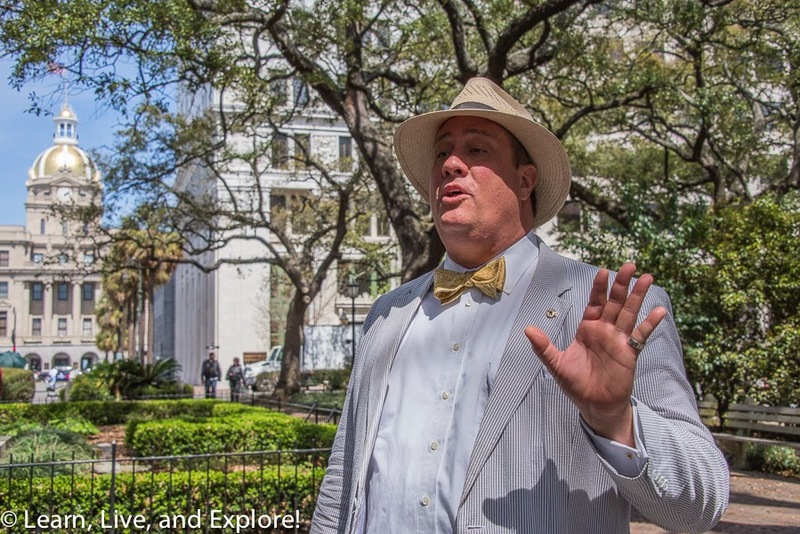 Also, who wouldn't enjoy listening to a man in a traditional Southern seersucker suit and bow-tie with a Georgian accent? 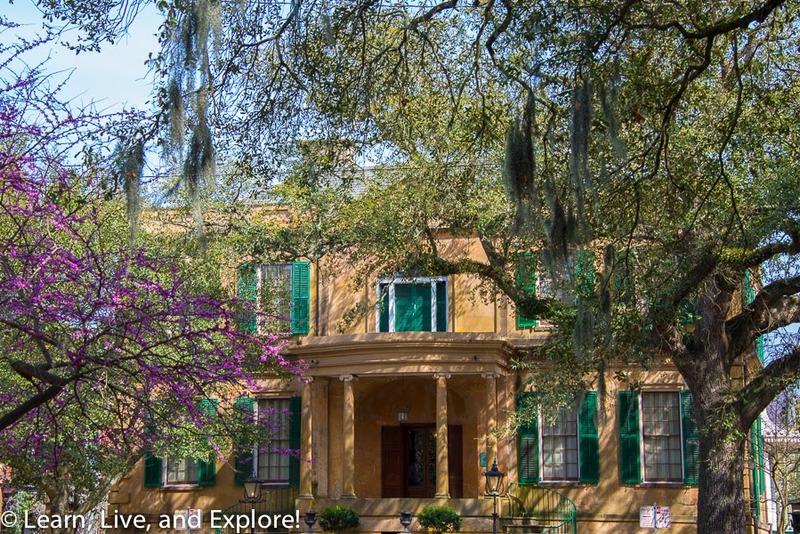 Sadly, I was not able to take one of the many ghost tours of this, allegedly, very haunted city. 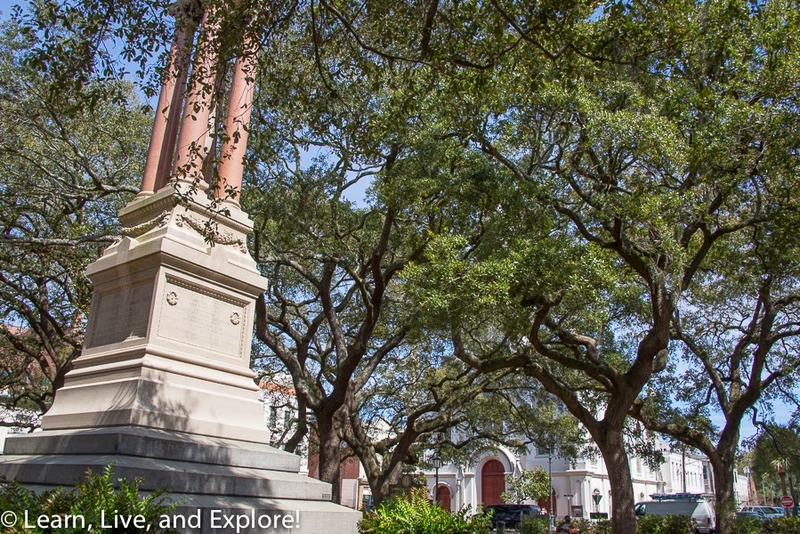 The tour started in Johnson Square near the gold domed City Hall. 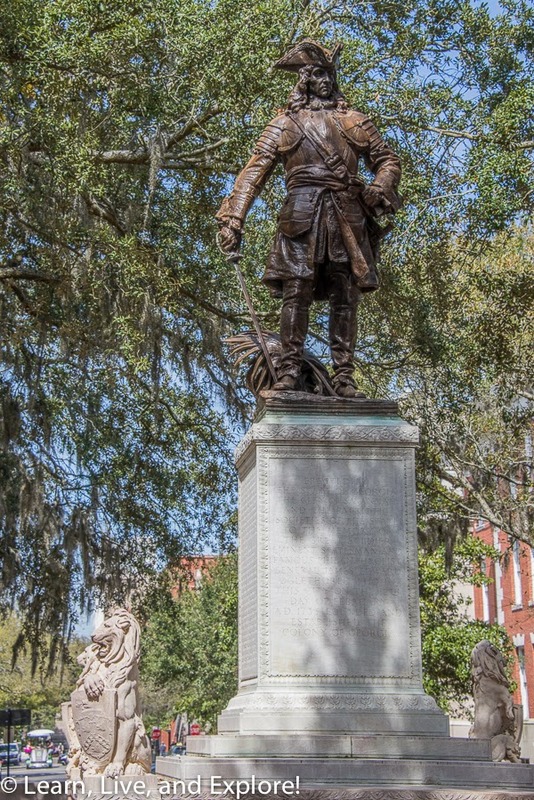 Savannah Dan (try it...it's fun to say!) 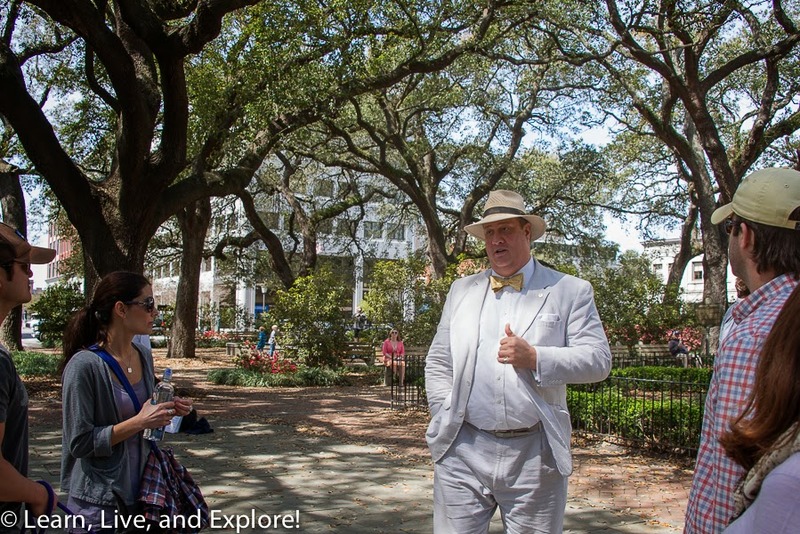 led us up Bull Street through several squares/parks, then over to Abercorn Street down to Reynolds Squares. 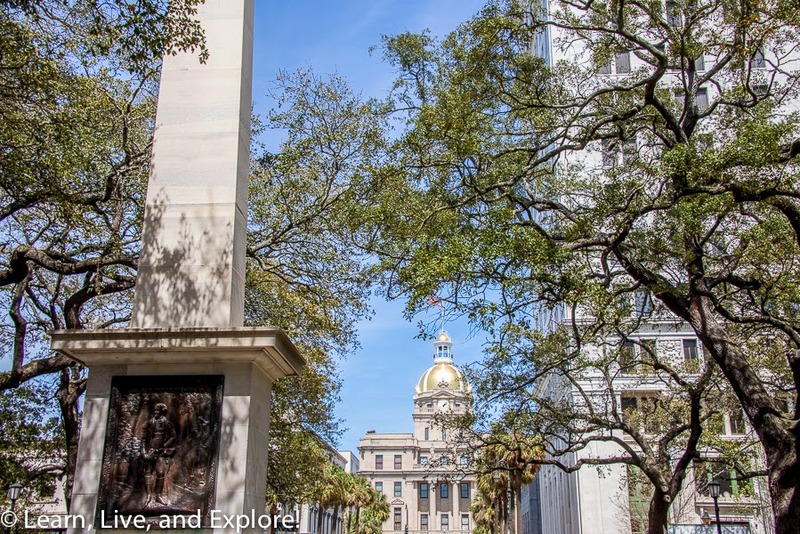 In Savannah, it's all about the squares and the historic buildings on the square. 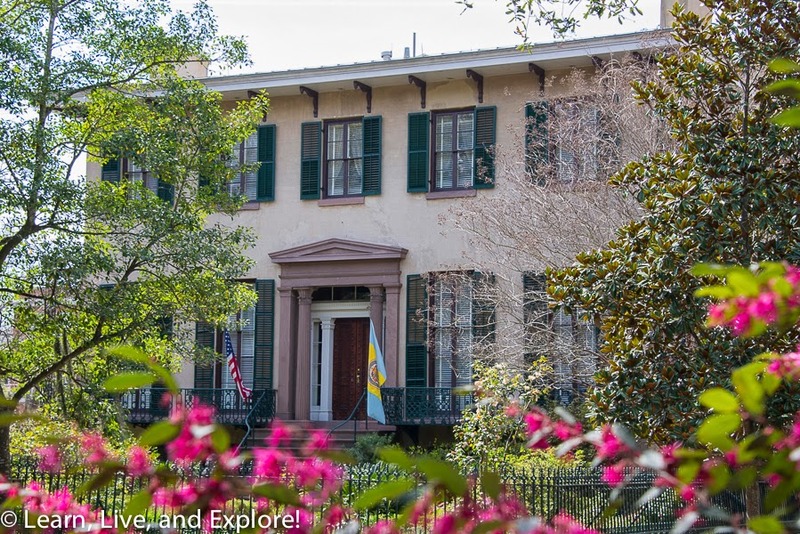 ...and at the Andrew Low House where Juliette lived with her husband, the son of Andrew Low who died in 1905, until she passed away in 1927 of cancer. A weird fact I uncovered in my research was that at her wedding, a grain of rice lodged in Juliette Low's ear and punctured her eardrum. She suffered from hearing loss for the rest of her life. Next time you get a bad wedding gift, remember that story and think that it could be a lot worse! 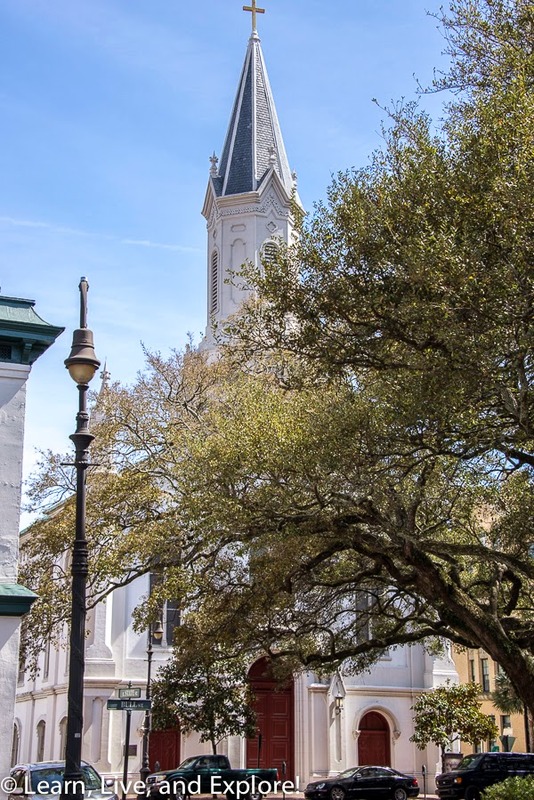 And finally, Savannah is all about a little old movie called "Forrest Gump" where a feather blows in the wind past a church steeple only to land on a bench in Chippewa Square next to Forrest waiting for a bus to see Jenny. Of course, the bench was a movie prop where the small brown sign is located today. And the normally counter clockwise-flowing traffic had to be shifted to clockwise for the movie. 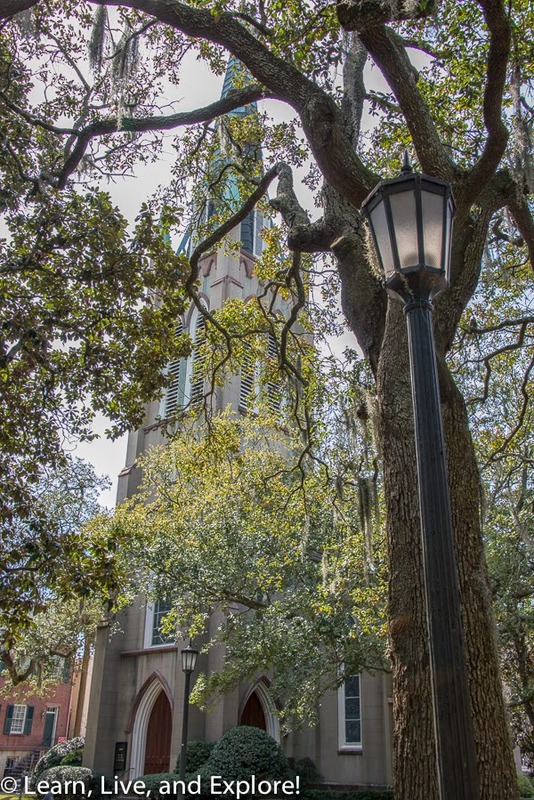 Once again, a friendly reminder to not touch the iconic Spanish Moss hanging from the trees, lest you desire to get a nice itchy case of chiggers. 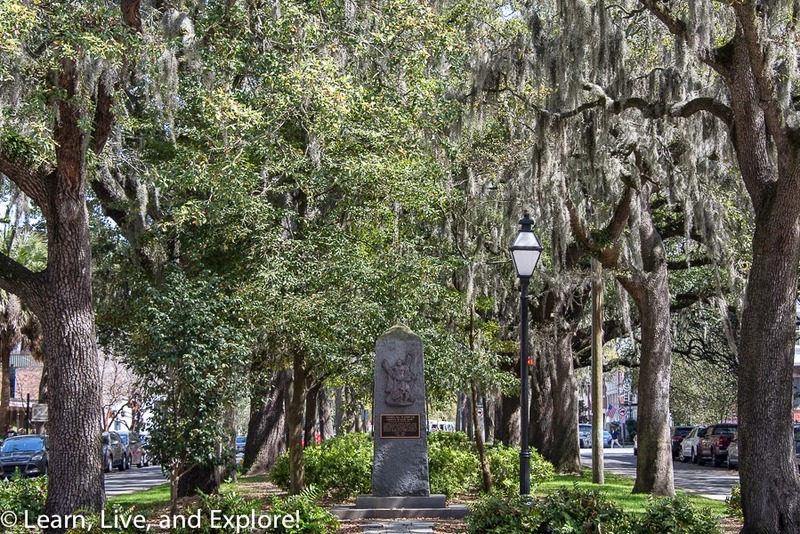 Also, I was told to be wary of traveling south of the historic district at night, particularly Forsyth Park. I wanted to take a night photo of the fountain, but after hearing a local tell me to rethink that, I did. 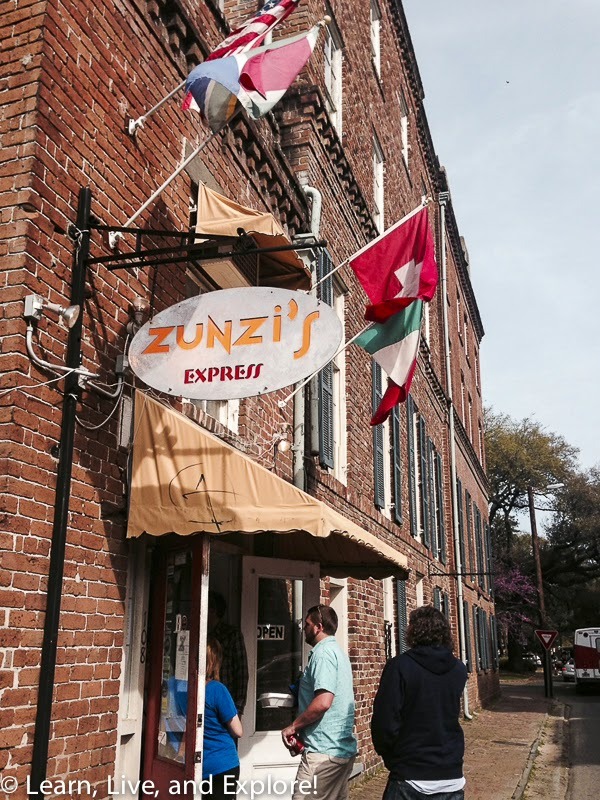 Zunzi's (108 E. York St.) - featured on two Food Network shows and most recognized for their "Godfather" sandwich. The lines can get long at times, but there are two location options. 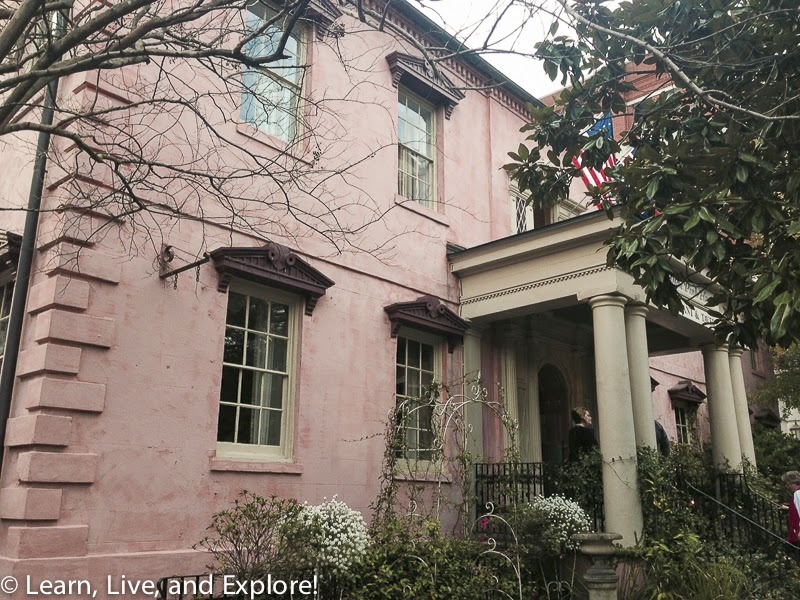 The Olde Pink House (23 Abercorn St.) - this restaurant is located inside a Georgian mansion built in 1771 with a history as a home and as a bank. Today, the restaurant occupies the main and top floor, while a neat, naturally-lit tavern is in the basement. 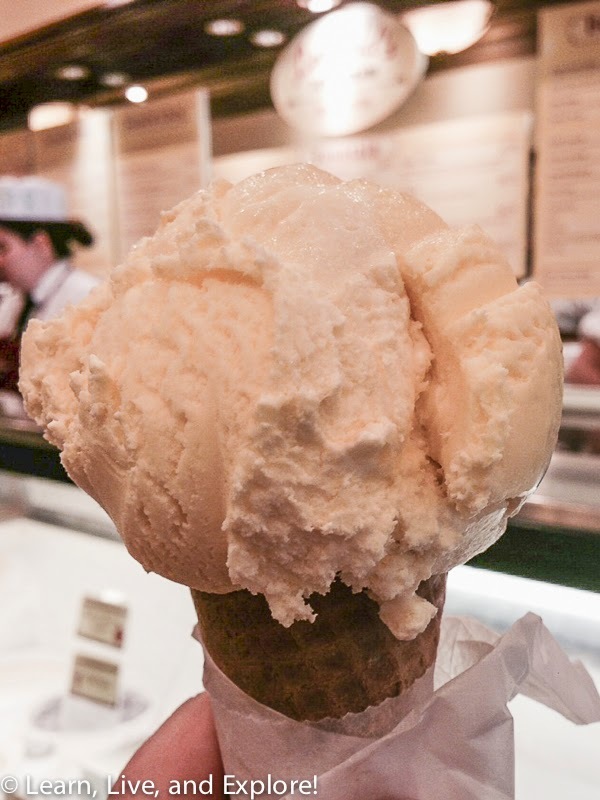 Leopold's (212 E. Broughton St.) - this ice cream store was established in 1919 by the three Leopold brothers and is now run by one of their descendants, Stratton Leopold, who is better known as a Hollywood producer for blockbuster films, like Mission Impossible 3 and Sum of All Fears. There is usually a long line out the door, but it moves quickly. I got Lemon Custard because it was the same recipe as the original 1919 flavor. 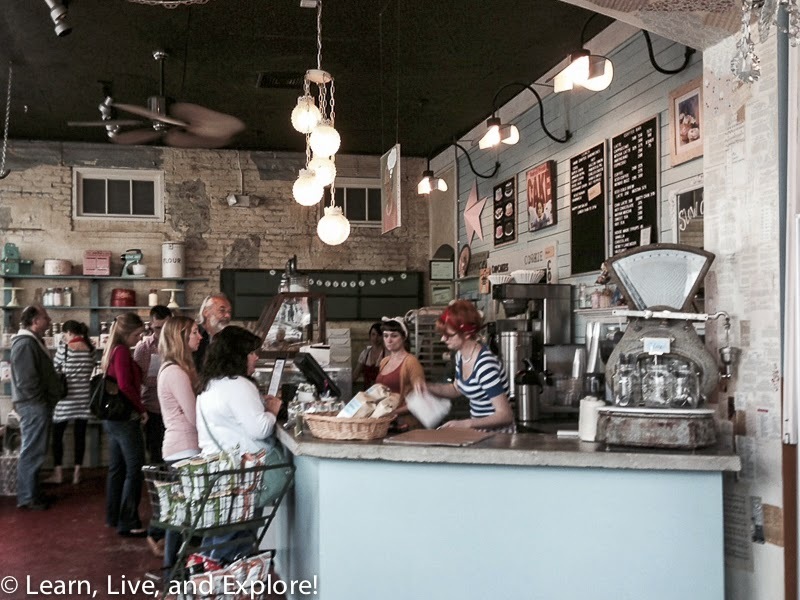 Back in the Day Bakery (2403 Bull St.) - a small cafe and bakery with a vintage/shabby chic theme is located far enough outside of the historic district where you will need to drive or take a pedicab. 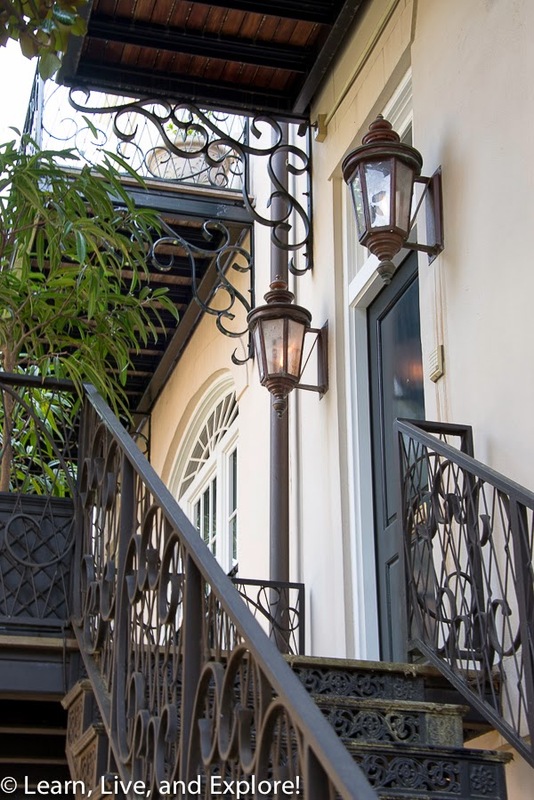 Lady and Sons (102 W. Congress St.) - I would think that this Paula Deen restaurant is a must for any fans visiting the city. Crystal Beer Parlor (301 W. Jones St.) - this former Prohibition-era speakeasy and illegal hooch distributor supposedly was the first American eating establishment to serve alcohol after the repeal. Today, you can get typical American bar food and they have a decent beer list that includes some local craft beers. Lulu's Chocolate Bar (42 MLK Jr. Blvd.) 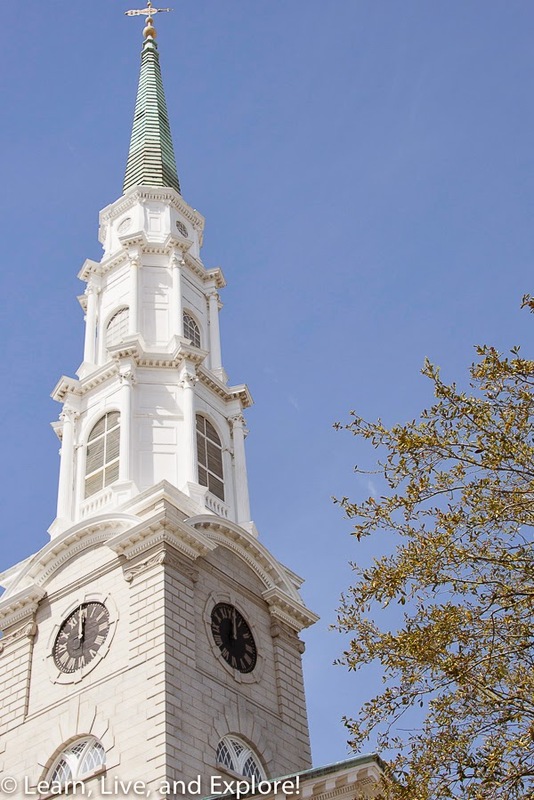 - if you're looking for dessert, this was recommended by a life-long Savannah resident. Mrs. Wilkes Dining Room (107 W. Jones) - the line forms early for this family style seating eatery. Kayak Cafe (1 E. Broughton St.) - a convenient cafe near all the shopping with fresh Mexican food. B. Matthews (325 E. Bay St.) - this was a recommendation for brunch, but I didn't end up making it to my reservation. If I did, I had planned on getting the waffles! 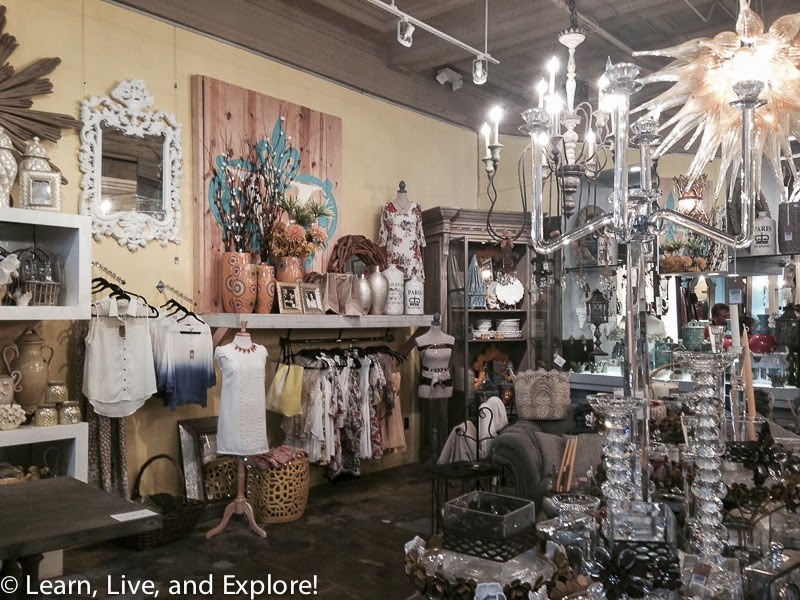 Villa Savannah (109 W. Broughton St.) - part Anthropologie, part West Elm, part Z Gallerie, you can find some great home decor and cute outfits or accessories...a one stop shop! 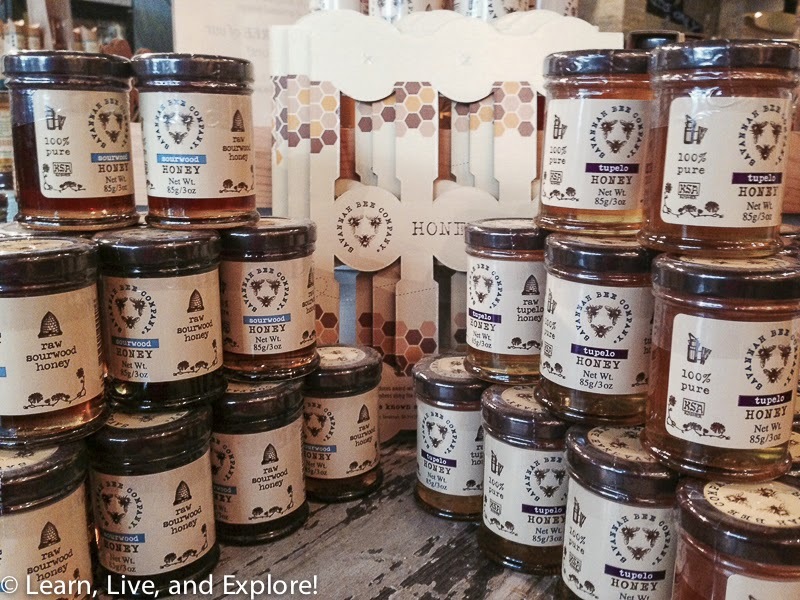 Savannah Bee (104 W. Broughton) - they have a honey tasting bar with lots of samples! A great spot for gifts to bring home with you. 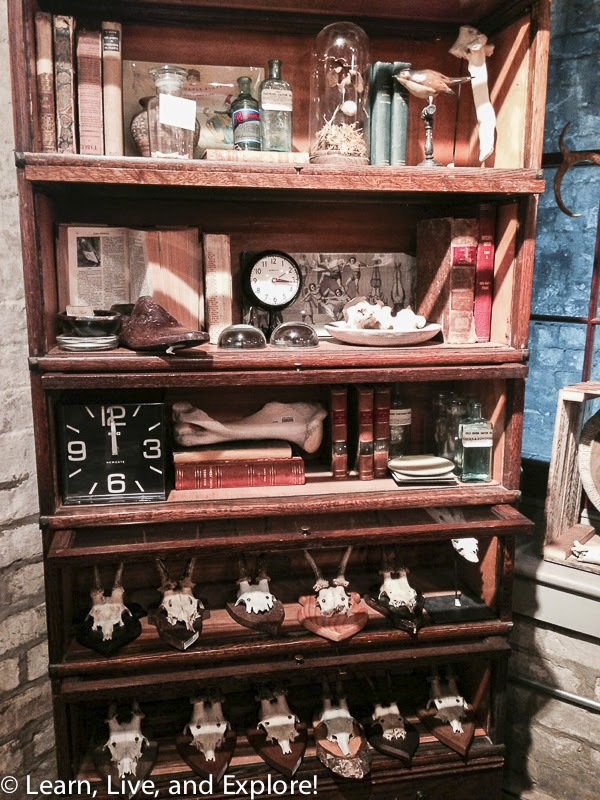 The Paris Market & Brocante (36 W. Broughton St.) - this store is very cute! 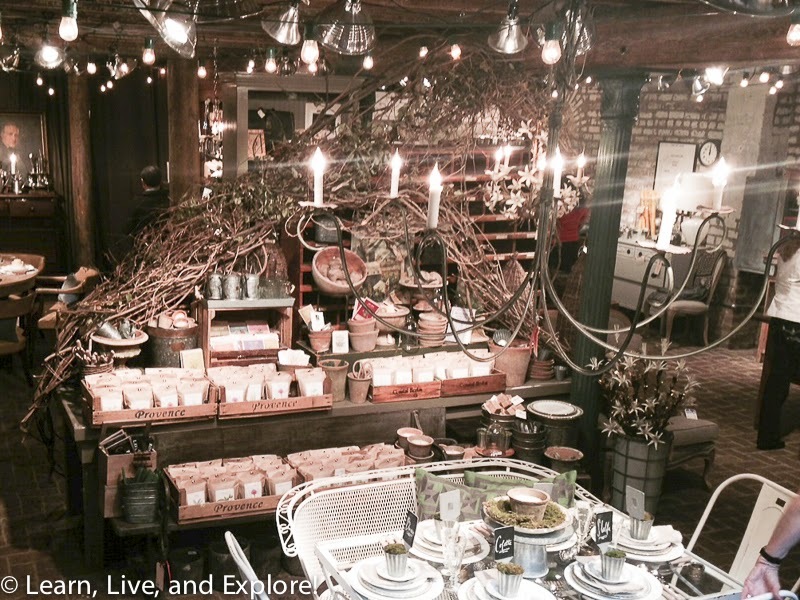 Lots of rustic gifts and home goods. Fun to browse, even more fun to buy goodies! Satchel (311 W. Broughton St.) - at this store you can get a personal handbags designed for you or you can go ahead and design your own. The finishing time depends on the complexity. 24e style (24 E. Broughton St.) - a contemporary furniture and home decor store where you may just stumble upon something really neat, like an jet engine cover coffee table. 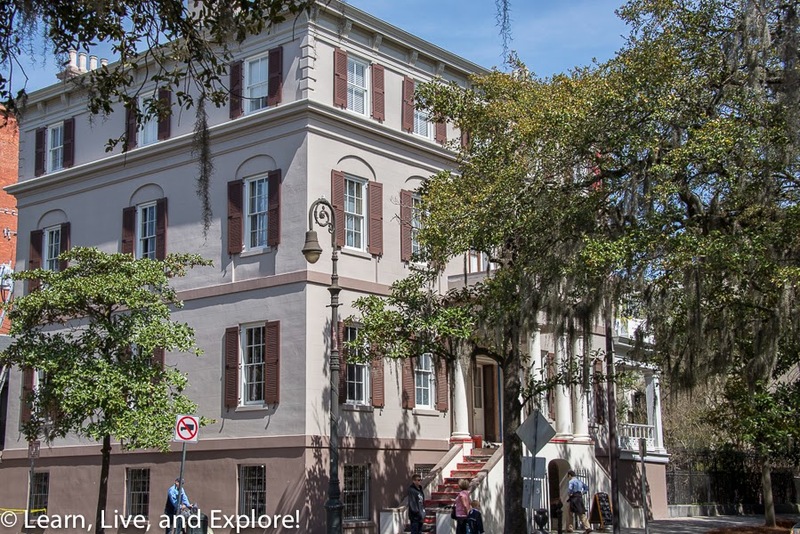 E. Shaver Bookseller (326 Bull St.) - Savannah's oldest book store. shopSCAD (340 Bull St.) - art and home goods created by students and graduates of the local design college, Savannah College of Art and Design. A really good post man, very thankful and hopeful that you will write many more posts like this one.